How do you know if there’s a leak in your sprinkler system? 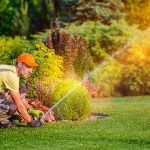 Even the smallest of leaks can cause damage to your Omaha lawn or landscape, and there are some vital signs to look for, not just when starting up your system in the spring, but also throughout the year as your system works on its scheduled on and off pattern. One of the tell-tale signs of a leak is a change or difference in water pressure when the system is on. Just like when a pipe breaks in your home, the pressure is released, and water cannot flow with force. If your system isn’t spraying at all, or if the water trickles out, there may be a leak in your system. Leaks in your Omaha lawn sprinkler system can also be diagnosed by looking closely at your lawn’s growth and greening patterns. Watch for areas that are greener above the water lines or around particular sprinkler heads. Another sign to look for is evidence of mold or mildew on your lawn; this could indicate the water is pooling there and a fungus has set in. Water bubbling up when the system is on can indicate a potential leak, as can an area of your lawn that has become sunken or recessed. Small holes in your lawn can also indicate water seepage. And speaking of holes, if you have a dog, you might want to make sure they haven’t accidentally dug up a sprinkler head and damaged a line while digging in your yard. Look for evidence of damage or exposed lines that may have been punctured during your pet’s backyard escapades. Many leaks can be fixed without professional intervention, but some require a little more expert help and guidance. If you locate a leak, the best thing to do is call Above & Beyond CGM right away. Most leaks can be fixed quickly and at a minimal cost. It isn’t advisable to begin digging, especially where other underground lines may be present. The best way to minimize leak issues is to perform regular maintenance on your in-ground sprinkler system. We have sprinkler system specialists and Omaha lawn care experts on staff ready to help. Call Above & Beyond CGM at (402) 934-8866.